Here’s a bit of what we’ve been up to…. Daryl had his recheck for his hip replacement surgery at the Mayo. All looks great and he has the go-ahead for physical therapy. While we were there, I surprised the kids with $10 each to spend at Rochester’s giant thrift store, Saver’s. My boys pooled their money for light sabers, nerf guns, tech toys and mini figurines. Anna used her cash for yarn, an awesome high-tech watch, a wizardry book that goes along with Harry Potter crafts, and a 39 Clues card collection case. Jack and I have been playing this game like crazy to help him learn his multiplication facts (and also because it’s just plain fun). It’s called Roll n Multiply and you play it similarly to tic tac toe but it’s far more fun. Jack and I love it. 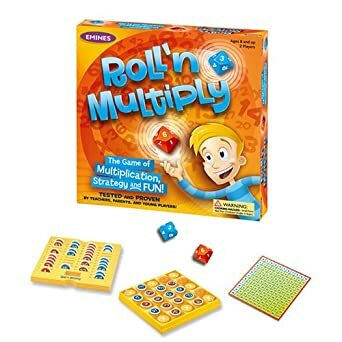 You roll two dice and multiply the numbers (they are 10 sided), then put the game piece with that number on it anywhere on the board flipped to your color. The object is to get 4 in a row. BUT, if you roll a number that is already on the board you can take it and use it elsewhere (whether it was yours or your opponent’s, you just flip it to your color and put it where you want it), so you can move things and unblock lines that were blocked before. So if I had 3 in a row and Jack blocked me with his orange 24, and then I rolled 6×4, I could flip over his 24 to purple and win. It’s part luck, part strategy, part math. We play it a ton of and both of us like it. There’s a cheat sheet you can use if you don’t know your facts too, and I think Alex will be able to play it fine even though he’s only 5 and doesn’t know most of his facts yet. You really don’t need to know them but they end up learning them accidentally very quickly. I highly recommend it and I promised Jack I’d buy us a set of our own. You can check it out at the MSU library as soon as I return it and see if you guys like it. It’s nice and sturdy too, which I like. Here’s the link on Amazon (different cover now but the inside looks identical). We stayed at a hotel for a couple of days while we were there for the recheck and had fun swimming at the pool, putting together fun gourmet (gluten free, vegetarian, etc.) hotel room meals and splurging a bit one time. In other news, someone made these beautiful flint-knapped driftglass arrowheads for our family. Daryl struck up a conversation with the artist a few years ago as Daryl was looking for sharks’ teeth at a small local lake and this man was looking for arrowheads. They’ve networked a bit since then (the “primitive tech” community is a small and friendly one! ), and my sweetie offered him some big chunks of good flintknapping rock that we had sitting unused in our garage. In thanks, he made these for all of us. Aren’t they beautiful?! We’re also working on our seeds, readying the garden and so much more. Poor Fiona has been in and out of doctor’s offices and ERs the past week (she’s okay) and so much else is going on, but that’s a good bit for the first catch-up! Oh yes, and we’re in the middle of some crazy winter storm that’s got people all around us without power and everything is covered with ice. Trees and power lines are broken left and right, and there’s some pretty dire situations all around. Hopefully all of that will pass quickly. Minnesota winters are a bit like movie bad guys. Every time you think they’re finally dead, they grab your ankle and come after you one more time. 😉 I’m just pretending it’s green out there and going on with my garden planning. Hopefully it will be less than a month till the next check in!